James Tissot fled Paris in the aftermath of the Franco-Prussian War and the bloody Commune early June, 1871, and established himself in the competitive London art market. By March 1872 (and until early 1873), he lived at 73 Springfield Road; he then bought the lease on a medium-sized, two-storey Queen Anne-style villa, built of red brick with white Portland stone dressing, at 17 (now 44), Grove End Road, St. John’s Wood. The residents of the comfortable suburban homes around the Regent’s Park and the district of St. John’s Wood, west of the park, were merchants, bankers and lawyers. 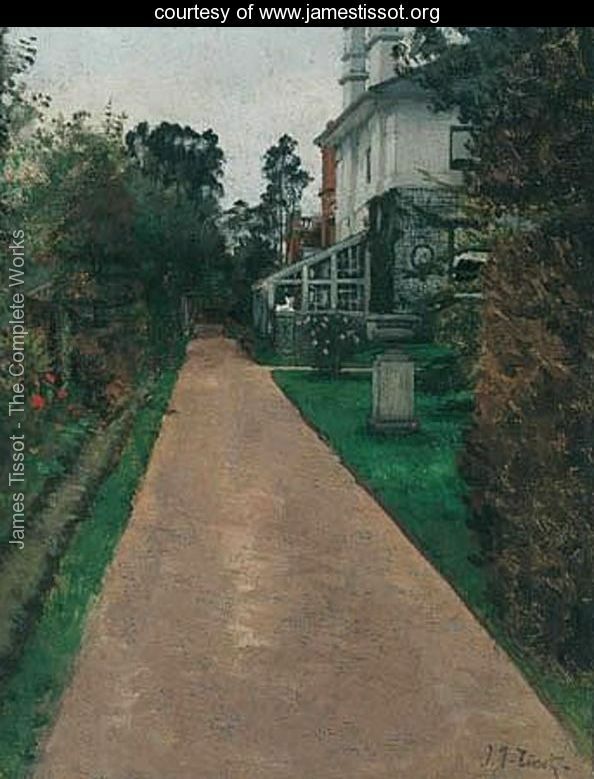 Tissot’s house, set in a large and private garden separating him from the horse traffic, omnibuses and pedestrians on their way to the park or the still-new Underground Railway station nearby, was built in 1825 on part of the grounds of the abbey for which Abbey Road was named. In 1875, Tissot built an extension with a studio and huge conservatory that doubled the size of his house. In the conservatory, he grew exotic plants, while his garden was designed with a blend of English-style flower beds as well as plantings familiar to him from French parks. Gravel paths led to kitchen gardens and greenhouses for flowers, fruit and vegetables. 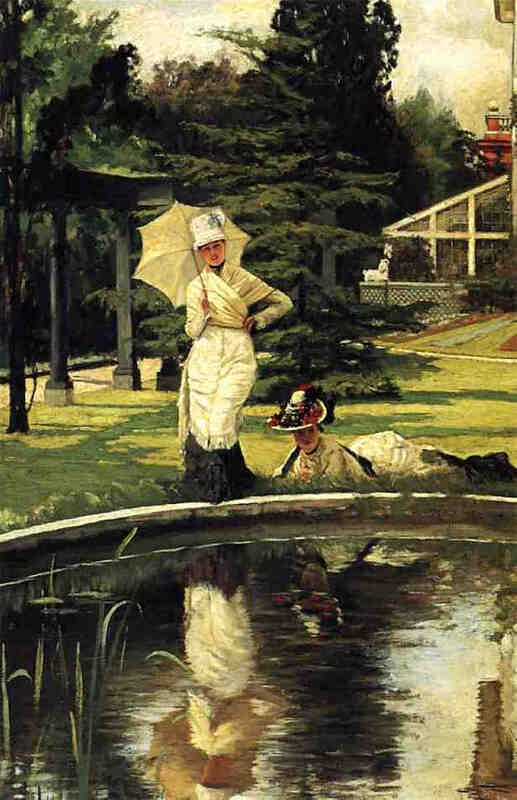 Tissot improved his garden with the addition of an ornamental pond and a cast iron colonnade, copied from the Parc Monceau in Paris, that ran in a curve from the south side of the pool towards the house. The series of columns, painted black, were rounded except the two at either end, which were square. A similar curved colonnade ran from the east end of the pool. The 1878 oil study, measuring 11 by 17 in. (27.94 by 43.18 cm), was sold at Sotheby’s, London in 1984) as Rêverie for $ 38,678 USD/£ 32,000 GBP (Hammer price). There are many stories about the death of Mrs. Newton, including one version in which she threw herself out of the bedroom window and died from her injuries. There is no account of such a suicide in The Times of 1881-82 or inquest lists, according to Tissot’s biographer, James Laver. Kathleen Newton died of tuberculosis on November 9, 1882, at age 28, at Tissot’s house with her sister, Polly Hervey, at her side (according to the death register). Tissot draped the coffin in purple velvet and prayed beside it for hours. Immediately after the funeral on November 14, at the Church of Our Lady in Lisson Grove, St. John’s Wood, Tissot returned to Paris. Tissot’s elderly gardener, Willingham, lived with his wife in a small lodge at the end of the garden. Willingham burned Mrs. Newton’s mattress on Tissot’s instructions, but otherwise left everything as it was when Tissot departed: though he took his paintings, all his paints and art supplies remained in trays in the studio. The basement was full of pots containing the materials for Tissot’s cloisonné work. His St. John’s Wood villa remained empty for about a year. 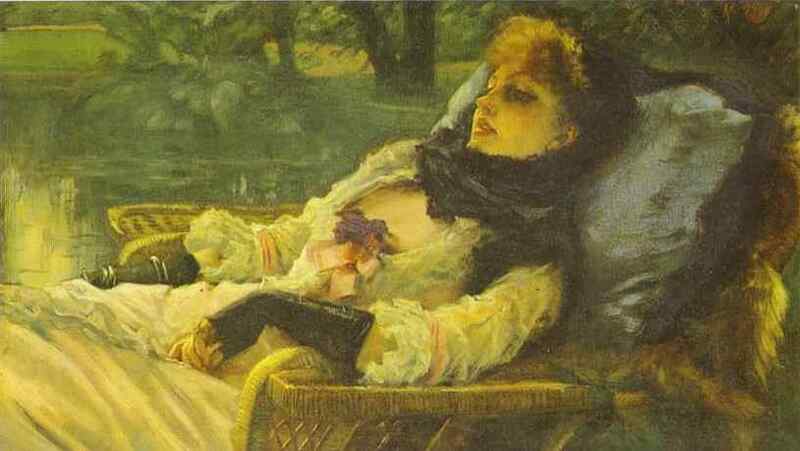 This entry was posted in Art blog, Art History, Impressionists and tagged James Tissot, Kathleen Newton, Mary Pauline Hervey, Polly Hervey on August 30, 2013 by Lucy Paquette, author of The Hammock: A novel based on the true story of French painter James Tissot. Three of James Tissot’s most well-known oil paintings made their way into public collections in Bristol, 120 miles west of London, and Southampton, about 80 miles southwest of London. James Tissot fled Paris in May or June, 1871, following the Franco-Prussian War and its bloody aftermath, the Paris Commune. He arrived in London with less than one hundred francs, and with the help of a handful of friends, he proceeded to rebuild his career. 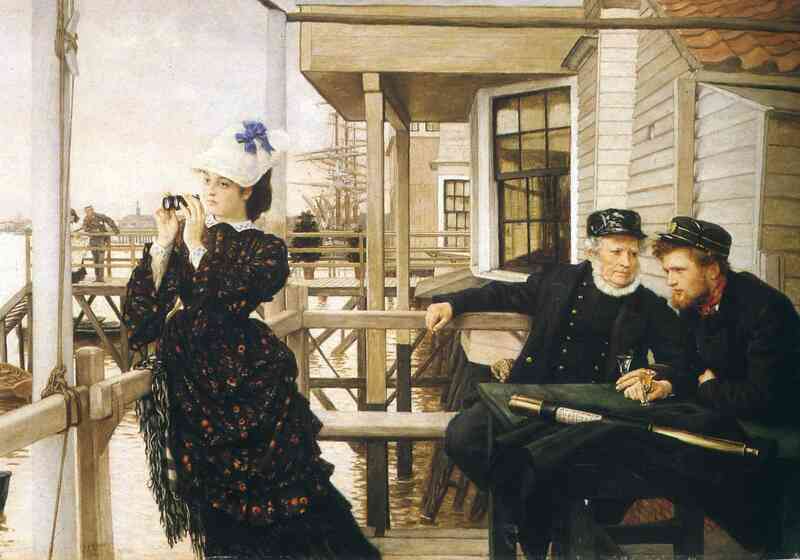 In 1872, TIssot exhibited Les Adieux (1871) and An Interesting Story (c. 1872; click here to read more about this picture at the National Gallery of Victoria, Melbourne, Australia) at the Royal Academy. Both paintings were eighteenth-century costume pieces calculated to appeal to the British public. Les Adieux was reproduced as a steel engraving by John Ballin and published by Pilgeram and Lefèvre in 1873 – an indication of its popularity. The picture was owned by wealthy international railway contractor Charles Waring (c. 1827 – 1887). After his death, it was sold at Christie’s, London for 220 guineas to the father of Lt. Col. P.L.E. Walker, from whom it was purchased by the Bristol City Museum and Art Gallery in 1955. Les Adieux is on display. 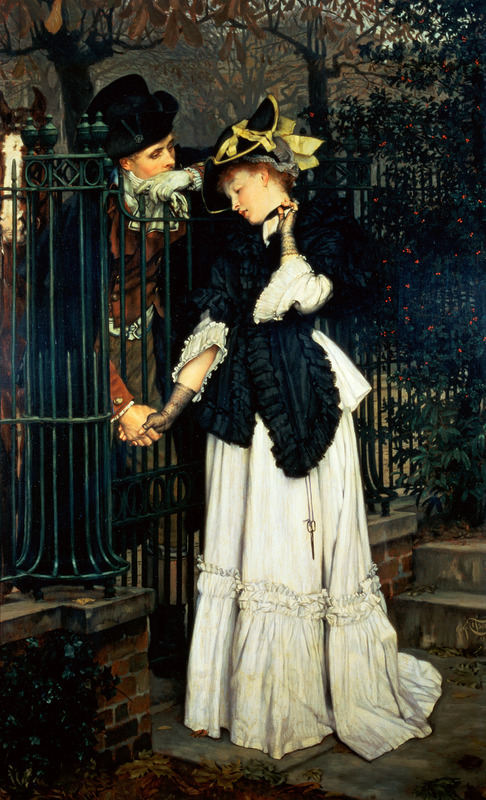 Prior to Tissot’s move to London, his paintings were much less sentimental than Les Adieux. 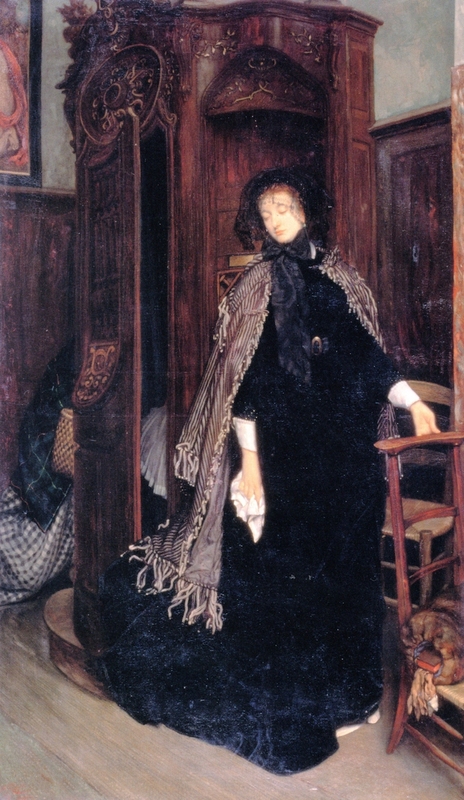 Leaving the Confessional (1865) is, like many of Tissot’s pictures, a little naughty for its time. To what sins has the lady confessed? Tissot exhibited it as Le confessional at the Salon in 1866, when he was 30. Still living in student lodgings in the Latin Quarter, he had gained considerable recognition and success in Paris. Offered as Leaving the Confessional at the Humphery Roberts sale, Christie’s, London in 1880, the painting failed to find a buyer at £162.15s. It was with George C. Dobell by 1886 and was purchased as In Church from the Leicester Galleries in London in 1936 by the Southampton City Art Gallery through the Frederick William Smith Bequest Fund. It is not on display. The watercolor version above, The Confessional, is smaller but otherwise is nearly identical to the original oil. It was commissioned in 1867 for 250 francs by American grain merchant and liquor wholesaler William Thompson Walters (1819 – 1894), whose art collection formed the basis of the Walters Art Museum in Baltimore, Maryland. Upon his death, his son and fellow art collector Henry Walters (1848 – 1931), inherited his father’s collection and bequeathed it to the Walters Art Museum at his death. Tissot’s watercolor has been included in several exhibitions over the years, most recently in 2005-2006, but it is not currently on view. Once Tissot had moved to London in 1871, he continually sought “British” subject matter, always offering it up with a French twist. He painted The Captain’s Daughter in 1873. 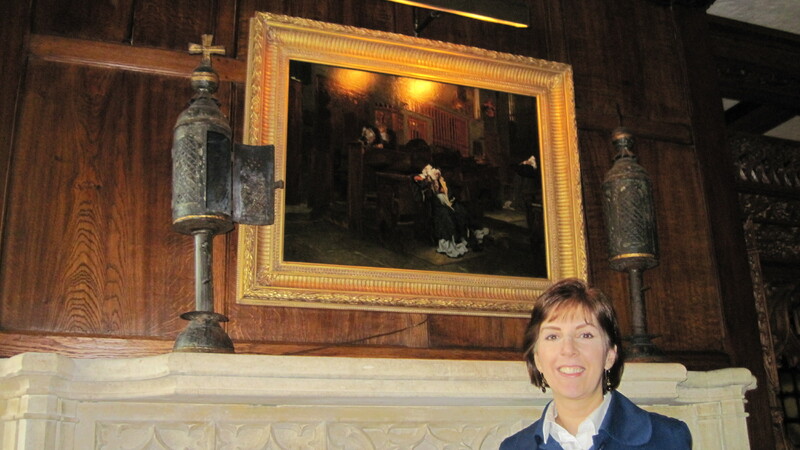 The painting is set at the Falcon Tavern in Gravesend, and the woman was modeled by Margaret Kennedy (1840 – 1930), the wife of Tissot’s friend, Captain John Freebody (1834 – 1899). Freebody was the master of the Arundel Castle from 1872-73, and his ship took emigrants to America. 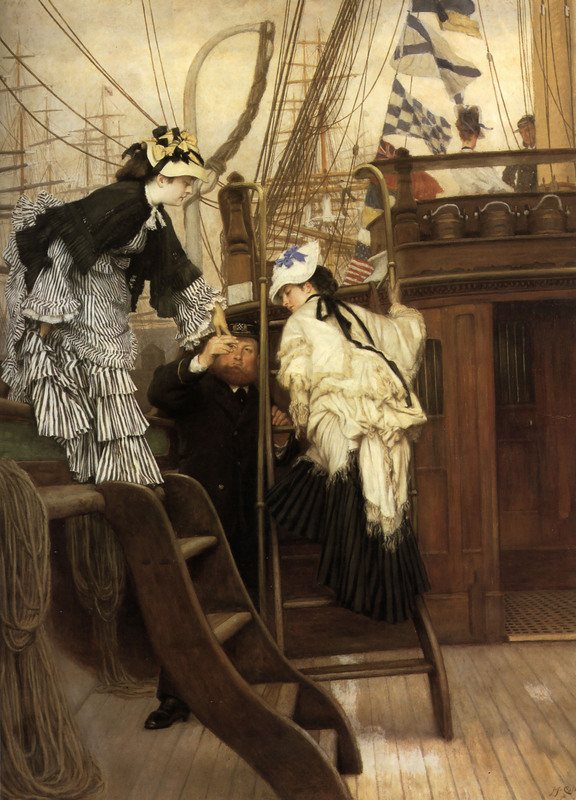 Tissot exhibited The Captain’s Daughter, as well as two other paintings [The Last Evening (1873) and Too Early (1873), both at the Guildhall Art Gallery, London], at the Royal Academy in 1873. The Captain’s Daughter was sold at Branch and Lees for £183 15s in 1903 and was later in the possession of The French Gallery at 11 Berkeley Square. It was with the Leicester Galleries, London by 1933 and was purchased through the Frederick William Smith Bequest Fund in 1934 by the Southampton City Art Gallery, where it is on display. 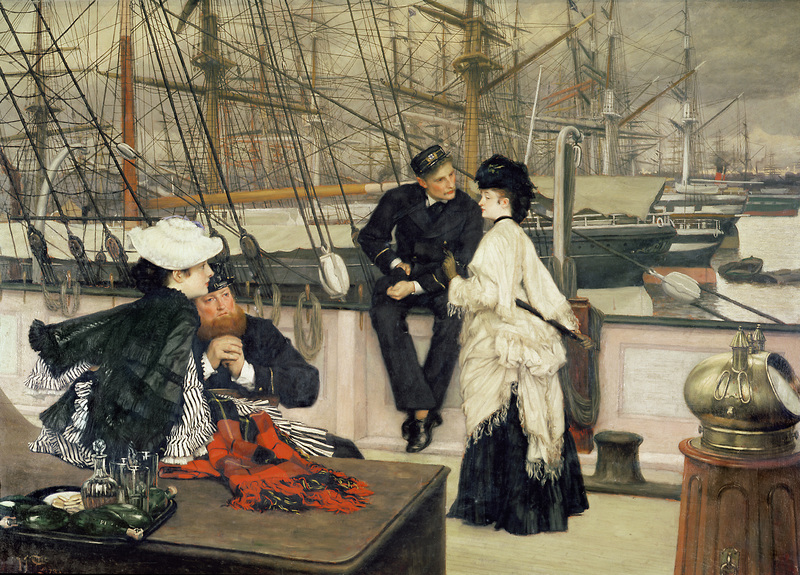 Two other paintings featuring Margaret Kennedy are in a private collection: Boarding the Yacht (1873) and The Captain and the Mate (1873), in which Margaret’s older brother, red-bearded Captain Lumley Kennedy (1819 – 1899), and her sister posed as well. 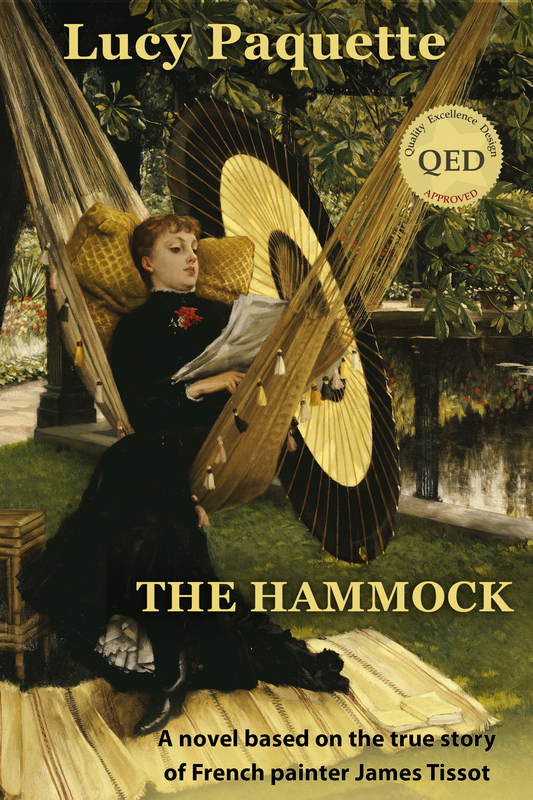 My book, The Hammock: A novel based on the true story of French painter James Tissot brings Margaret Kennedy, Captain John Freebody and Captain Lumley Kennedy to life. Read it to immerse yourself in the dynamic art world of Paris and London in the 1870s! 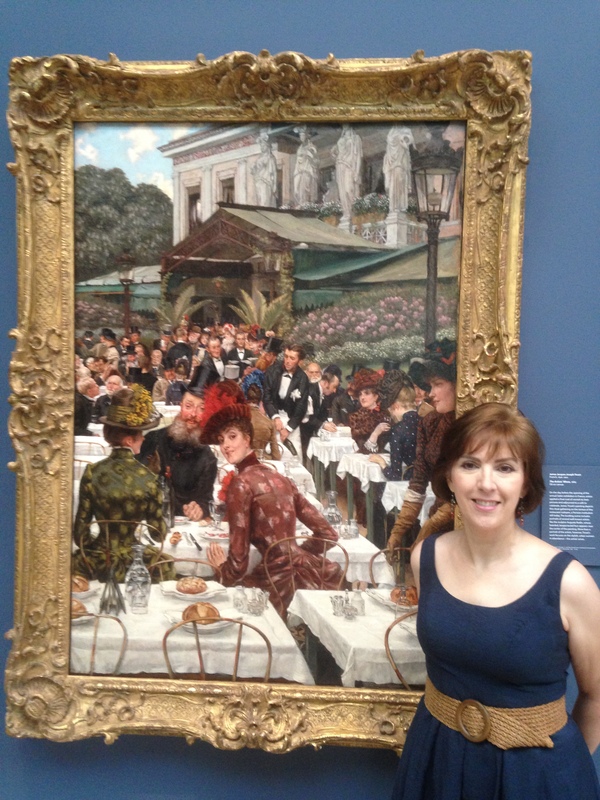 This entry was posted in Art blog, Art History, Impressionists and tagged James Tissot, Margaret Kennedy on August 21, 2013 by Lucy Paquette, author of The Hammock: A novel based on the true story of French painter James Tissot. By car, you could see five oil paintings by James Tissot within a week, starting in Philadelphia, then driving south to Washington, D.C., and driving further on to Richmond and Norfolk, Virginia. 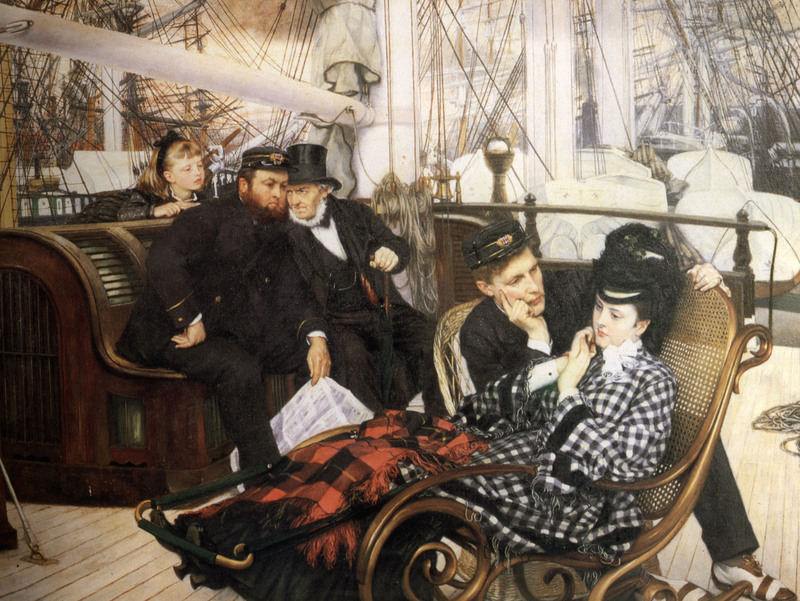 Together, these five paintings survey Tissot’s work from 1865 to 1885, from his shrewd start imitating a renowned Belgian artist, to his big break painting portraits in French aristocratic circles, to his happy domestic years in London with his mistress, and finally, to his determined attempt to make a comeback in Paris after her death. 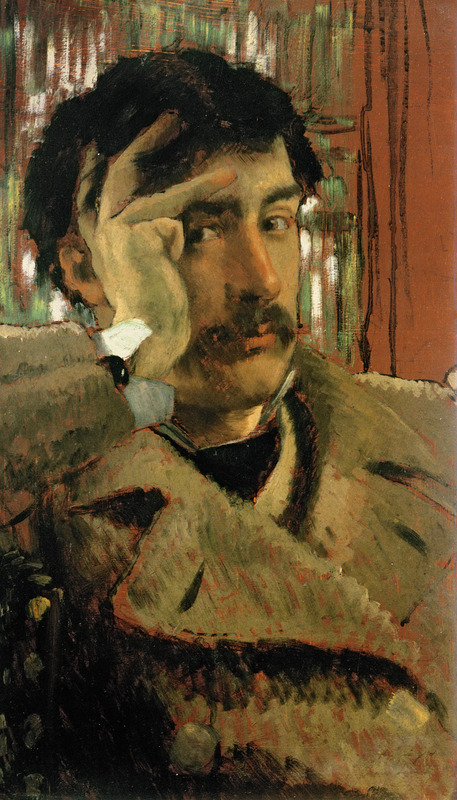 In 1859, Tissot traveled to Antwerp, augmenting his art education by taking lessons in Leys’ studio. 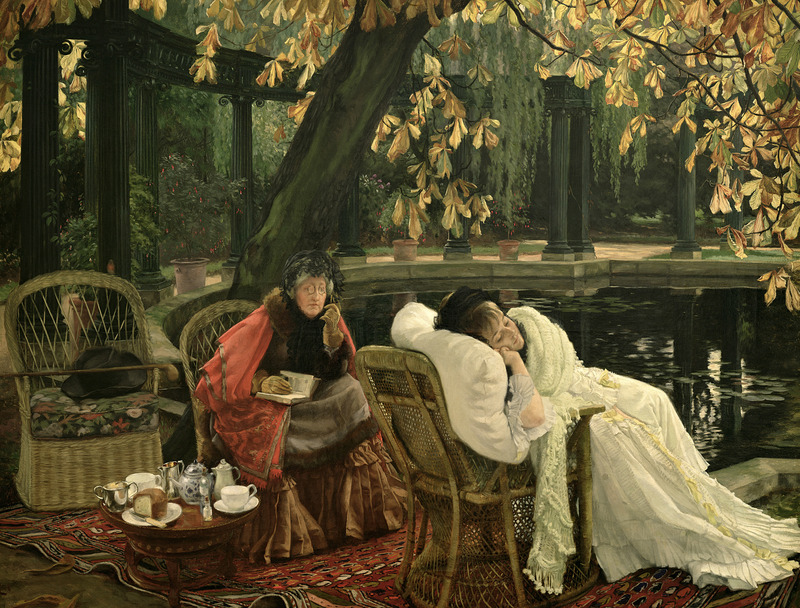 Of the six paintings by Tissot accepted for the Salon in 1861, three were based on Goethe’s Faust: The Meeting of Faust and Marguerite, Faust and Marguerite in the Garden, and Marguerite at the Service. Tissot had imitated Leys’ fifteenth-century costumes, historical architecture and meticulous details. 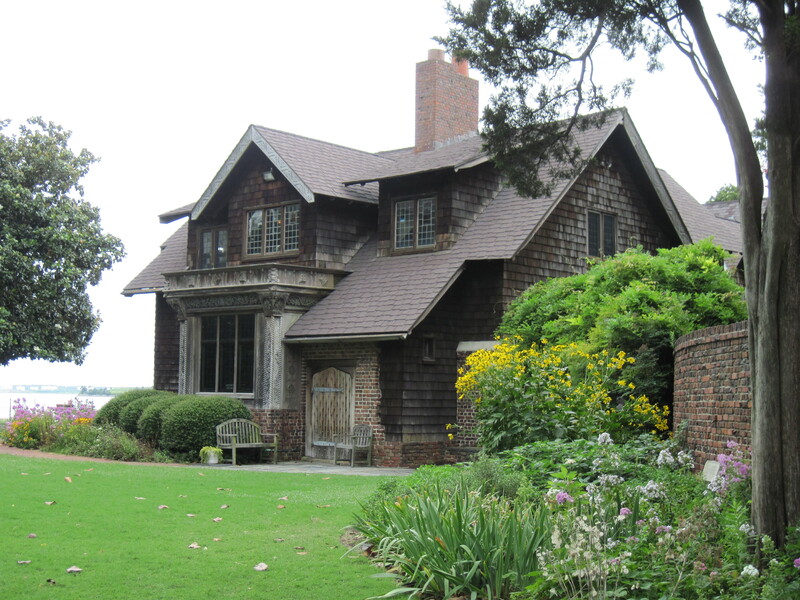 Mrs. Sloane helped secure the land for what would become the Chrysler Museum of Art in Norfolk, which began as the Norfolk Museum of Arts and Sciences 1926. William Sloane was its first president, and Florence Sloane its first director. Even so, Florence traveled to Europe and built an extensive art collection of her own, which was opened to the public in 1942. You can see James Tissot’s Marguerite in Church – now framed – at The Hermitage Museum and Gardens. In 1867, James Tissot painted Portrait of Eugène Coppens de Fontenay (1824 –1896), the president of the exclusive Jockey Club in Paris. Two years prior to this commission, Tissot had found his entrée to aristocratic patronage with The Marquis and the Marquise de Miramon and their children [René de Cassagne de Beaufort, marquis de Miramon (1835-1882) and his wife, née Thérèse Feuillant (1836 -1912), with their first two children, Geneviève and Léon on the terrace of the château de Paulhac in Auvergne]. Married in 1853, Eugène Aimé Nicolas Coppens de Fontenay had three children. His daughter, Marthe Jeanne-Marie (1854 – 1898), married Henri, Comte de Meffray [Henri Meffray de Césargues (1846 – 1927)] in 1876; the couple had two children and at least three grandchildren. Eugène’s second daughter, Françoise, was born in 1855, but there is no further information on her. His son, Robert Coppens de Fontenay (1858 – 1925), became a diplomat with the Belgian legation. He married in 1899 and had a son, Jacques Coppens de Fontenay (c. 1900 – 1991). Portrait of Eugène Coppens de Fontenay remained in the family until 1971, when it was sold at Christie’s, London for $ 4,352/£ 1,800. Seven months later, the small but arresting portrait was with the Herman Shickman Gallery, New York, before being purchased by the City of Philadelphia with the W. P. Wilstach Fund in 1972. It is on display at the Philadelphia Museum of Art in Gallery 151 on the first floor (European Art 1850-1900); you’ll see it as soon as you enter the gallery. James Tissot fled Paris in mid-1871, after the Franco-Prussian War and its bloody aftermath, the Paris Commune. He rebuilt his career in London, and within a few years he was living in a large home at 17 (now 44), Grove End Road, St. John’s Wood (west of Regent’s Park) with his young mistress and muse, Kathleen Newton (1854–1882). Hide and Seek (1877) shows Mrs. Newton reading in Tissot’s studio while her nieces and children play. The painting was sold at Christie’s, London in 1957 for $ 2,379/£ 850, then at Sotheby’s, London in 1963 for $ 6,159/£ 2,200. Mrs. C. Behr, London, owned it until at least 1967, after which it belonged to Julian Spiro, Esq. In 1976, it was sold at Christie’s, London for $ 33,002/£ 20,000. 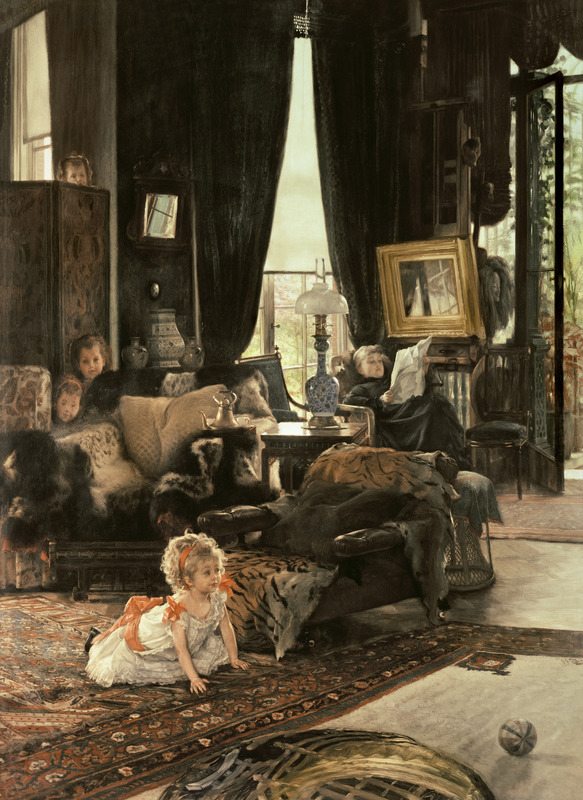 Two years later, Hide and Seek was purchased from the Herman Shickman Gallery, New York with the Chester Dale Fund by the National Gallery of Art in Washington, D.C. You’ll find Tissot’s depiction of his cozy (and soon to end) domestic life in the East Building, Ground Floor, Gallery 103E, tucked away with the Small French Paintings. Study for “Mrs. 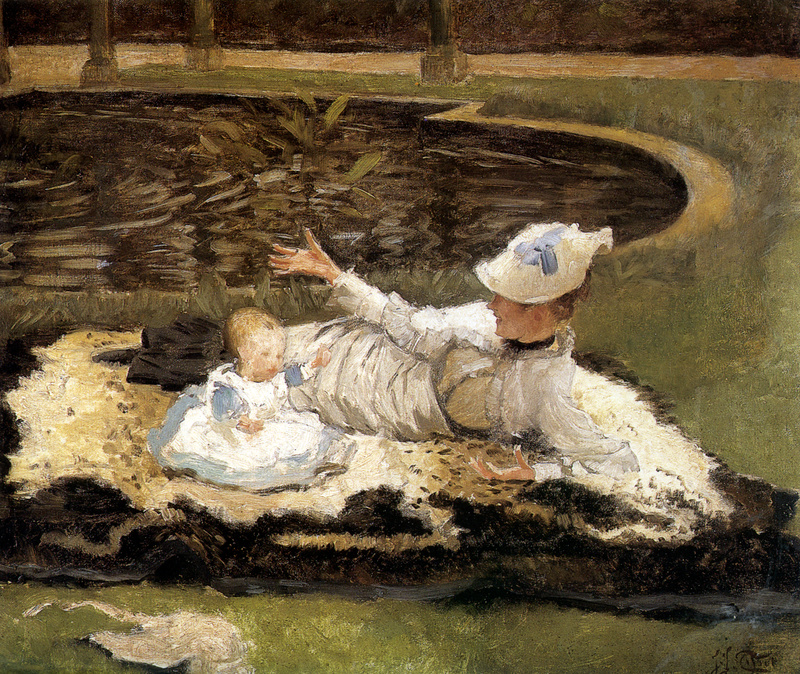 Newton with a Child by a Pool” (c. 1877-78) depicts Kathleen Irene Ashburnham Kelly Newton in the garden of Tissot’s home in St. John’s Wood, London. This lively oil sketch was given to the Virginia Museum of Fine Arts (VMFA) in Richmond, Virginia by the American collectors and philanthropists Mr. and Mrs. Paul Mellon in 1983. 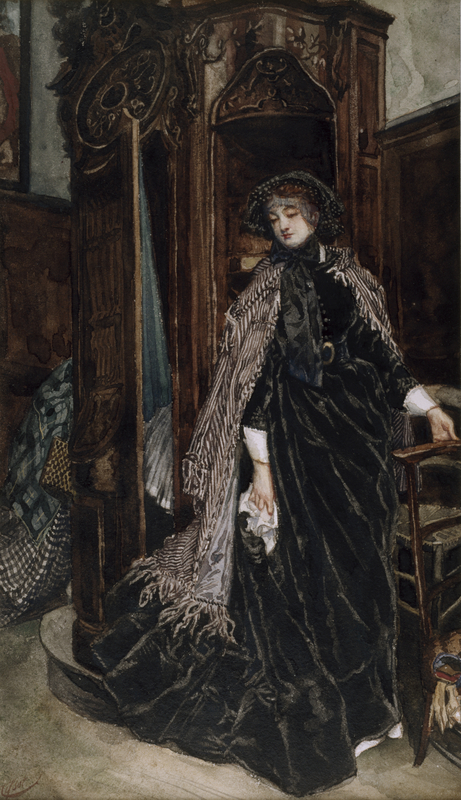 Shortly after Kathleen Newton died of tuberculosis in 1882, James Tissot left London and returned to Paris. During his eleven years in London, he had declined Edgar Degas’ invitation to show his work with the artists who became known as the Impressionists. Making his comeback in Paris in 1885, Tissot displayed a set of fifteen paintings at the Galerie Sedelmeyer called La Femme à Paris (The Parisian Woman). One of them, The Artists’ Wives (also called The Artist’s Ladies) (1885) depicts a gathering of artists and their wives on Varnishing Day, the evening before the official opening of the Salon, the annual art exhibition in Paris at the Palais de l’Industrie. The artists could put a final coat of protective varnish on their work, and they and their wives and friends could view the exhibition privately. 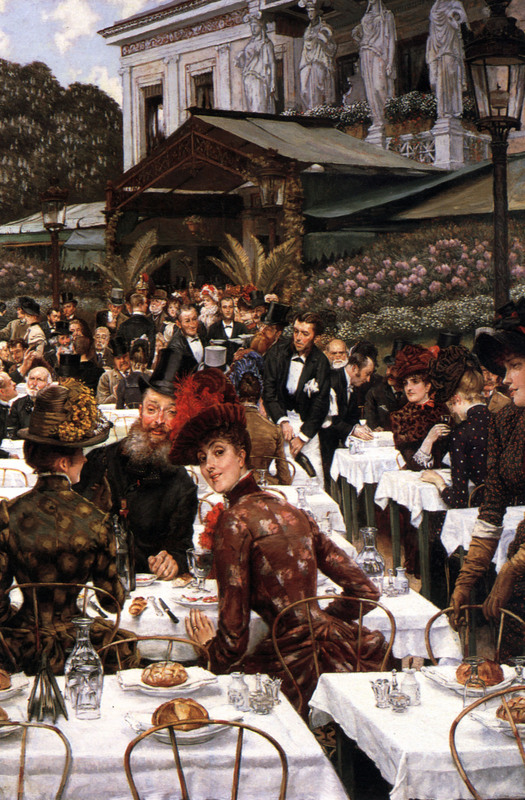 Tissot depicts the celebratory luncheon on the terrace of the restaurant Ledoyen, with the entrance to the Palais de l’Industrie in the background. Celebrities present include the sculptor Auguste Rodin (1840 – 1917), the man with the brown beard and spectacles standing in the center of the picture. The series was also exhibited in London, at the Tooth Gallery, in 1886. In 1889, The Artists’ Wives was sold at Christie’s, London. It belonged to a Mr. Day, then to Philadelphia art dealer and critic Charles Field Haseltine. By 1894, it was with the Art Association of the Union League of Philadelphia, and by 1981, it was with M. Knoedler and Co. in New York. It was a gift of Walter P. Chrysler, Jr., and The Grandy Fund, Landmark Communications Fund, and “An Affair to Remember” to the Chrysler Museum of Art in Norfolk, Virginia, in 1981. I am grateful to Michelle Hevron, Fine Art Research Assistant, Margaret R. and Robert M. Freeman Library, Virginia Museum of Fine Arts, Richmond, Virginia, for providing information requested for this article. This entry was posted in Art blog, Art History, Impressionists and tagged James Tissot on August 11, 2013 by Lucy Paquette, author of The Hammock: A novel based on the true story of French painter James Tissot.